Peacefully at Lakeridge Health in Oshawa on Saturday, December 20th, 2014. Doug, in his 93rd year. Beloved husband of Rita Kathleen (née Tait). Loving father of Donald (Eva) Flintoff, Dennis (Mary) Flintoff and Deborah (late Brian) Marsh. Dear grandfather of Jennifer (Tim) Patfield, Daryl (Debbie) Flintoff and Mackenzie and Colin Marsh. Great-grandfather of Rylee, Hayden and Ethan Patfield and Drew Flintoff. Brother of the late Glendon and Ronald Flintoff. Missed by sister-in-law Ilean Flintoff and several nieces and nephews. 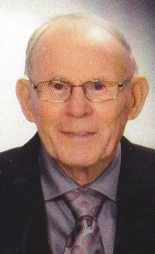 Doug was a World War II veteran of the RCOC, a founding member of St. Joseph The Worker Church, member of St. Joseph The Worker Knights of Columbus Council #9989, member of the Royal Canadian Legion (Branch #43) and of St. Joseph's Seniors Group. Relatives and friends may call at McINTOSH-ANDERSON-KELLAM FUNERAL HOME LTD., 152 King St. E., Oshawa (905-433-5558) on Friday, January 2nd, 2015 from 2-4 and 7-9 p.m. Prayers at 2:00 p.m. The Knights of Columbus will have prayers at 8:00 p.m. Mass of Christian Burial will be held at St. Joseph The Worker R. C. Church, 1100 Mary St. N. (at Beatrice St. E.), Oshawa on Saturday, January 3rd, 2015 at 12 noon. Interment Resurrection Cemetery, Whitby. Donations in memory of Doug to St. Joseph The Worker Building Fund or to a favourite charity would be appreciated. Online condolences may be made at www.makfuneralhome.com. Our thoughts and prayers are with you and may God's love keep you all. Our hearts go out to each and every one of you on your loss. Our deepest sympathy to you, Don, Dennis, Debbie and their families. You are in our thoughts and prayers. Thoughts & prayers to Rita & family. Doug was like a second father. I respected and admired him immensely. He will be dearly missed. Rita: Fond memories of your beloved Doug.We are with you in spirit. My heart goes out to you at this very difficult time, it is so hard to loose your best friend after so many years together.I pray God will give you strength and many dear friends and a good V54Yfamily to support you. Well done good and Faithful Christian. May you see God face to face. Rest in peace. Will be out of Canada, will offer a Mass for Doug. A great man who will be dearly missed. Our condolences to Rita and her family  on your loss. Rita: Our sincere sympathy to you and your family.